A lot of golf group captains make their life and their buddies lives difficult because they try to run golf events in all the wrong ways. One way to annoy everyone is to send a lot of e-mails around with status updates and spreadsheets. It is particularly annoying to those who have already responded that they cannot play golf that day but still receive updates, jokes, and irrelevant information regarding the event. You can start to efficiently manage your golf group when you set up a golf event using TeeTimeHelper. Your buddies and group members will thank you! As you can see it is easy to invite one golfer, or many golfers. If you run out of specified tee times it is simple to add another tee time. Sending a message to your golfers is efficient because you can choose to send your message to everybody, only send it to those who are attending, only those who are not, or only those who haven't responded. By targeting your e-mail messages you are limiting your audience which your golf group will appreciate and makes your communication more effective - when one of your members receives a message from you they know it is important. Randomizing your event mixes up those who have RSVP'd yes with the available tee times. Locking your golf event prevents your members from changing their RSVP's. Cloning your event is an easy way to create your next event by pre-filling the e-mail addresses and names. You will want to do this for your next event! Finally, you can print a formatted tee sheet or remove the event altogether. Note that removing the event is not reversible; you will be given a stern warning before you continue to do that. What are you waiting for? Become and effective golf leader today! One of the nice features in TeeTimeHelper is the ability to randomize a golf event. It's only available to the golf administrator (the event organizer) as you probably don't want any of your group randomly changing tee times around. 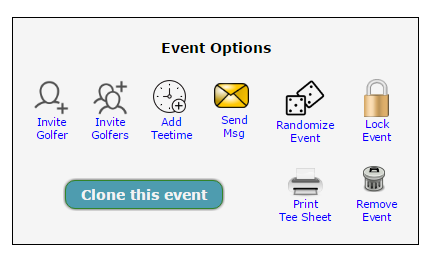 When you click on the "Randomize Golf Event" link it will show you the breakdown of the number of groups and the number of people in each group so you know what to expect if you do confirm the randomization. Determining the number of golfers in a group a takes a calcuation because we just don't want to fill the maximum number of golfers for each group - this can lead to one person by themselves in the last group. So we definitely don't want someone in a group with no partner, and we certainly don't want a 2-ball (2 person group) stuck behind a 4 person group. Say you have 9 players and 3 golf groups. Filling the first two groups with 4 people each and one golfer left over is no good. You could have the first group with 2 people, the second with 3 people, and the last group with 4. We don't think this is ideal and our system detects this situation and will set it up as 3 groups of 3 to avoid the variation in numbers. We always put the smaller group first so that they do not get frustrated behind a larger group which takes longer to play. Randomizing an event also sends e-mail to each golfer who have RSVP'd yes to update them that the event was randomized. As you are the administrator you have the ability to randomize the event again but another e-mail will be sent to all your golfers. Even after randomizing the administrator can also adjust the groupings by manually changing the tee times if necessary.